Sunset over the Bosbaan, Amsterdam. 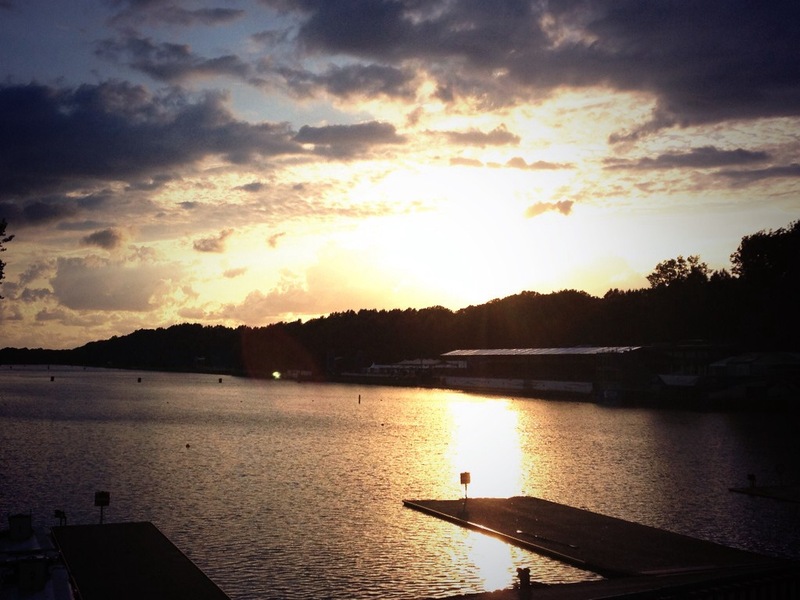 It’s been nearly three weeks since we returned to the United States from the 2014 World Rowing Championships held on the windy Bosbaan in Amsterdam. It goes without saying this blog update is a bit overdue. It was actually only a week ago that I finally navigated the World Rowing website to find our Women’s Double Sculls A Final video and rewatched the race. Outside of the Olympics, the World Championships are the pinnacle of training and competition for every year. In a sport like rowing, the World Championships are arguably more competitive than the Olympics. To be a World Champion sits right up next to being an Olympic Champion. So much energy, emotion and thought goes into this one week of competition, that you welcome the short break you have afterwards, before starting the cycle back up all over again. 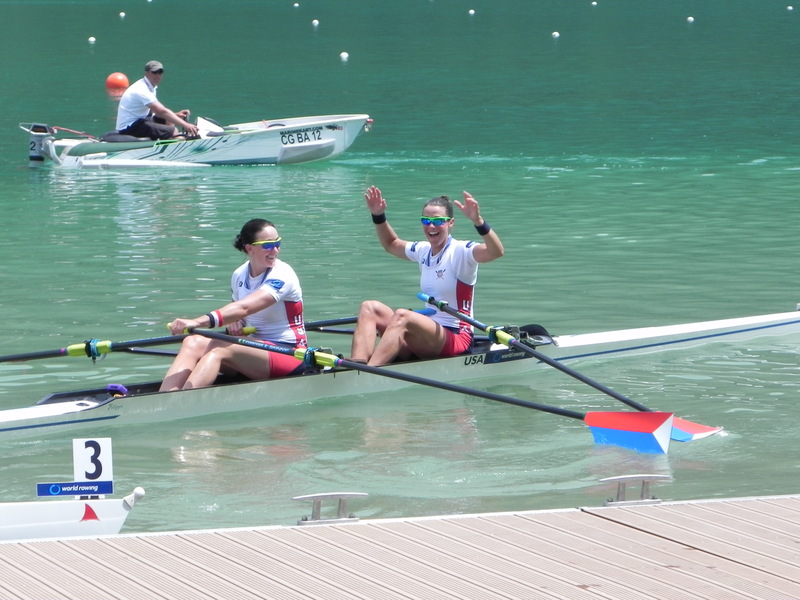 Ellen and I made it into the A Final of the Women’s Double Sculls, placing an overall sixth out of 22 entries. While this is a great step up from our seventh place B Final winning performance at last year’s World Championship, we were still disappointed. Our goal (and truly any competitor’s goal) is to come away with a medal. It was a decent end to an overall successful 2014 season. In just our second year together, we handedly won the U.S. National Selection Regatta; went on to take a silver medal at World Cup II in France (our top finish as a crew yet); won double gold at the 2014 Holland Beker Regatta; placed fifth in a very tight first through sixth finish at World Cup III in Switzerland; and finished sixth in the world at the 2014 World Rowing Championships. 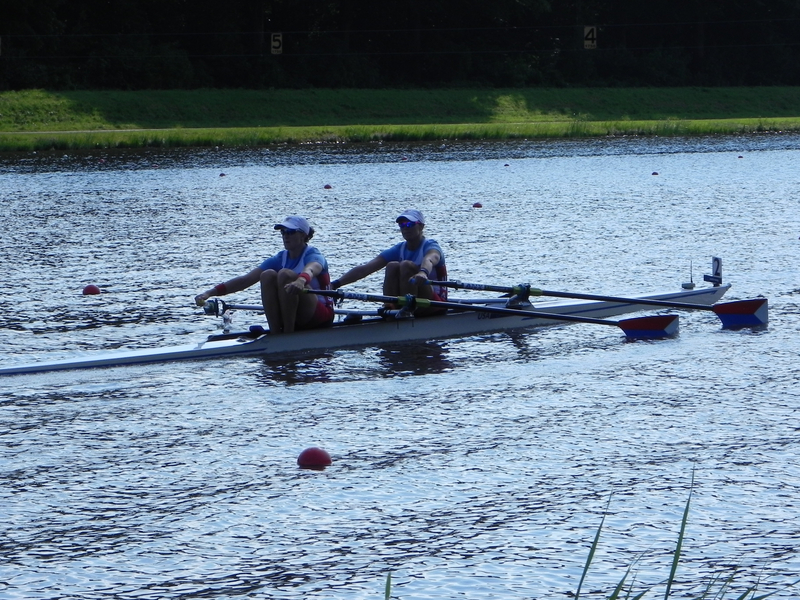 In a field as deep and incredibly talented as the women’s double, making the A Final is a huge success in itself. Among the top 8-10 crews in our event, it truly is anyone’s game on any day, and that’s what makes the women’s double so exciting. World Cup II silver medalists (I’m excited). This year’s World Championships was a strange regatta with some funky things happening throughout the week. The Bosbaan in Amsterdam is not known as the fairest of courses and it lived up to this reputation during race week. The raging winds and fast water–if you found yourself in the right lane–made for a record-breaking streak as fourteen new world records were set. And that doesn’t include the multiple times a new record was set and then broken again in the same day. I don’t think there has ever been one regatta in which that many world best times were shattered. Mull over that one for a bit. Pretty insane. On a related note, the wacky weather unfortunately played a huge role in the conditions of the course from lane to lane, and there was much discussion (and I’ll go as far as saying argument amongst NGBs and the Fairness Committee) throughout the week about the incredible impact this had on results. From day to day, it was a sort of pick your own adventure: lanes were reseeded, lanes weren’t reseeded, races were cancelled, races weren’t cancelled. We were not so lucky with lane draws and how the wind decided to blow on our particular days of racing. In three out of the four races we had on the Bosbaan that week, the conditions were a determining factor and we found ourselves at a strong disadvantage in the poorest lanes. BUT, aside from the uncontrollable forces of nature, the event itself was very well run. Amsterdam knows how to put on a great show. After a few weeks of “down time” since our return to the states—which, down time generally just translates to unstructured (continued) training–I’m already chomping at the bit to get back into the boat. The year ahead promises even stiffer competition as we are one more year closer to the 2016 Olympics in Rio. It is the Olympic qualification year, which means the 2015 World Championships carry even greater weight. Bring on the sweat. Bring on the pain. Bring on the progress. Meghan, love your updates early or late. Love the recap of the year and how you explain to us the conditions of the competition. It helps me to get a better picture of your adventure. 2016 seemed so far away when you first started and now you are saying that 2015 is the Olympic qualification year! Goodness! Love your spirit –Bring on the sweat. Bring on the pain. Bring on the progress. I know that you will go after it with all of your spirit! Blessings! Not too long ago you were a softball player and a video intern schlepping camera gear around John Paul Jones Arena…and now you’re #6 in the world in a sport you hadn’t even tried until AFTER college! I always thought you were amazing and I still do. You can do anything you put your mind to doing. Thanks for continuing to inspire and for bringing joy to all those who are rooting for you! Terrific recap of your experience. As Mike Moraghan points out above, you are an inspiration! If you haven’t yet read “The Boys in the Boat” you will love it.